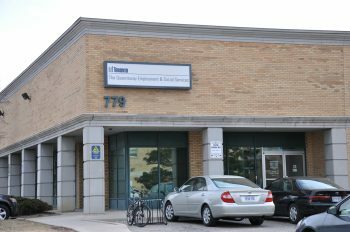 The Queensway Employment & Social Services provides drop-in services and resources to help you during your job search, and issues financial benefits through Ontario Works. TTC Directions: From Royal York subway station, take the 76 Royal York South bus to The Queensway. Walk west on The Queensway from Royal York Road. We are located on the south side of The Queensway at 779 The Queensway, at the back of the complex. Employment services including resume and interview preparation, job search and job placement provided on the 2nd Thursday of each month from 1:30 – 4 p.m.
Settlement counsellor providing support, programs and services for newcomers available on the 2nd Wednesday of each month from 10 a.m. – 12 p.m.
Employment support for people with disabilities available on the 1st and 3rd Tuesday of each month from 9:30 a.m. – 3:30 p.m.
Employment services and employment essentials programs for low-literacy individuals available on the 4th Tuesday of each month from 10 a.m. – 12 p.m.
Settlement services to newcomers in more than 40 languages available on the last Thursday of each month from 1 – 4 p.m.
Employment services, job search, pre-employment training and job placement available on the 3rd Tuesday of each month from 1:30 – 3 p.m.
Housing support and assistance with housing applications available on the 2nd and 4th Tuesday of each month from 1 – 4 p.m.
Employment services for youth and clients who are out of school and out of work available on the 3rd Wednesday of each month from 2 – 4 p.m.